ASHTABULA - The proposed alignment of the North Shore Trail was unveiled during the first public meeting for the project on Thursday, Jan. 17, at Briquettes in the Ashtabula Harbor. The meeting included a presentation of the preferred North Shore Trail route and plan options, as well as an open house in which guests could ask questions and see the North Shore Trail plan. In 2018, the Ashtabula County Metroparks signed a contract with the Environmental Design Group for design and engineering services to construct the North Shore Trail from 58th Street to the Ashtabula Harbor and Lake Erie. The project is now expected to begin in 2019. The North Shore Trail will be part of the 110-mile Great Lake to River Trail, as well as the Industrial Heartland Trail, Frimerman said. It will extend the current Western Reserve Greenway Trail from the Trumbull County line to Lake Erie, some 32 miles away. “It is primarily on road,” Frimerman said. More details about the alignment would come later in the meeting. “The funding for the project is primarily through the Ohio Department of Transportation and federal Department of Transportation money passthroughs,” Frimerman said. Money also has come from the Civic Development Corporation, the Ohio Department of Natural Resources, the Robert S. Morrison Foundation, the Ashtabula Foundation and others. The North Shore Trail is 30 years in the making, Frimerman said. He believes the proposed trail is the most practical, direct trail, with the least resistance and fewest obstacles. “Since most of the land is owned or controlled by the City of Ashtabula, as only right, we have a memorandum of understanding between the Metroparks and the City of Ashtabula,” Frimerman said. The right of way for the entire route is already secured, Frimerman said. Environmental Design Group Director Michelle L. Johnson then talked about some of the specifics of the proposed alignment of the North Shore Trail. She went over the types of sites and users. “We’re receiving ODOT dollars through a very competitive grant program called Transportation Alternative Program,” Johnson said. By accepting the funding, they have to follow a lot of rules and regulations, she said. This is phase 1, she said. The trail is 4.25 miles, and a lot of it is on road, Johnson said. “Without any bridges, without any major environmental issues, our typical ODOT, standard trails are about a million dollars a mile,” she said. To have a trail system completely separate from the roadway, when you start adding up a million dollars a mile, that gets pretty expensive pretty quickly, Johnson said. “Hence why we have a lot of different options,” Johnson said. She went through the different mix of segments for the North Shore Trail. The North Shore Trail’s southern terminus is at the Morrison Station Trailhead of the Western Reserve Greenway along West Avenue, continues through Smith Park, along Michigan Avenue and through the Michigan Avenue right-of-way, along West 8th Street to Goodwill Drive, through Point Park to Walnut Boulevard, and ends at the northern terminus of Walnut Beach Park. 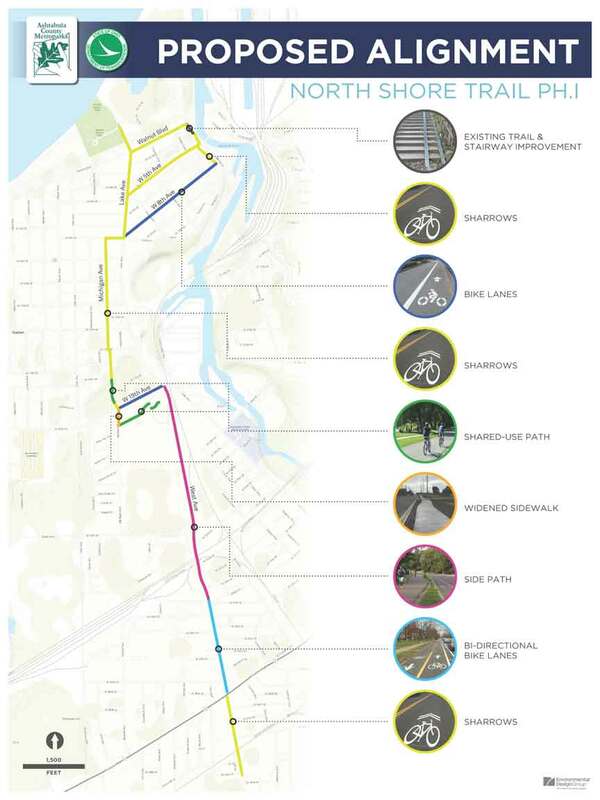 The mix of segments include sharrows; bi-directional bike lanes; side paths; widened sidewalks; shared-use paths; bike lanes; and existing trail and stairway improvements. lane markings, where arrows and a bike symbol indicate that bicycles and cars share the road, and bikes are riding on the road as a car. Sharrows will not be the only type of segment on the trail. Some of the segments will be more protected. “The more protected we make these bike lanes, the more willing are people to use them,” she said. The route will also include bi-directional bike lanes, which are not legal for pedestrians to walk in, she said. She talked about some of the space requirements for a bike lane, and space limitations are part of the reason why the entire route can’t be a protected bike lane. If a curb is present, then the designated bike lane needs five feet, and then an additional two feet is needed for a buffer, she said. To have them on both sides, you then need at least 12 feet, she said. A side path is an off-road facility, and 93 percent of the people who are willing to bike are only willing to ride on off-road facilities, she said. If you start thinking about putting in a 17-foot swap in an environment, it’s hard to fit that in, she said. There are some of these side paths in the proposed alignment, as well as some widened sidewalks and shared-use paths, she said. She also noted that a bike trench will be installed at the stairs on the hill by Point Park. The proposed alignment of the North Shore Trail.